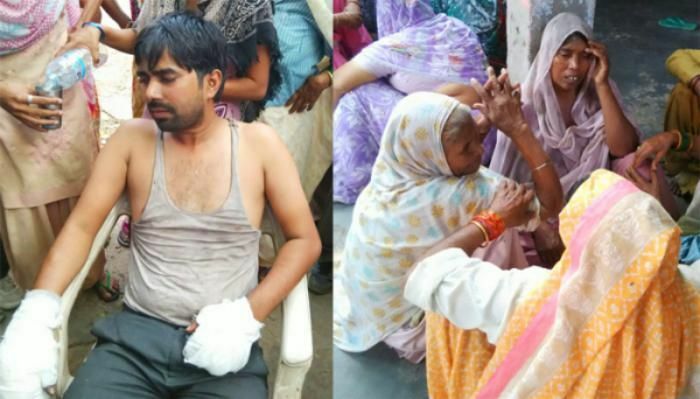 In a gruesome incident, four members of a Dalit family were set ablaze in Prithla region of Faridabad over an old dispute. The two children succumbed to their injuries, while the other two family members remain critical in Delhi's Safdarjung Hospital. According to some media reports, the incident took place in Prithla's Sunped village where the house of the Dalit family was set on fire at 4 am today morning. Vaibhav, who was two-and-a-half years old, and his sister, 11-month-old Divya, died on the spot after the attackers allegedly poured petrol and set the house ablaze. Their mother Rekha suffered 70 per cent burns and has been referred to Delhi for treatment while their father Jitender too suffered injuries while trying to save his family. Jitender alleged that the attackers were from Rajput caste and the family had a confrontation with them in October after which a case had been registered. "We were sleeping when they poured petrol from the window. I smelt the petrol and tried to wake up my wife but by then the fire had started. My children died in the fire...," said a wailing Jitender. "They had threatened me that they will finish my family, that I should never return to the village... I won't but please give me back my children," he said. The incident has led to tension in the area. "Security has been tightened in the village and we are investigating the matter," a police official said. Initial reports suggest that few unidentified people doused the house with petrol and set it on fire. The initial investigations are pointing towards an inter-caste rivalry behind the gruesome incident. Meanwhile, the Faridabad Police Commissioner reached the spot along with CFL teams and an investigation has been launched. According to media reports, so far cops have detained two people in connection with the incident . Reportedly, the police suspect that the incident was a reaction to the arrests of 11 people last year who were accused of murder. Home Minister Rajnath Singh telephoned Haryana CM Manohar Lal Khattar and expressed his concern over the incident. He also asked Khattar to ensure security of everyone in the state. In 2010, a similar incident took place in Mirchpur village of Hisar district in Haryana, when an elderly Dalit man and his 18-year-old physically challenged daughter were burnt alive and both of them succumbed to their injuries.